Since 1972, VERGEZ AVD SOLUTIONS based in Saint Médard en Jalles (33) has specialised in the hotel and catering industry, supporting numerous international brands in the realisation of audio, video and digital projects. 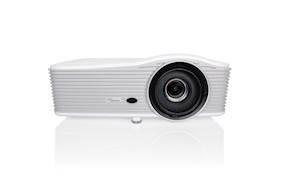 The Optoma ProScene EH515T projector is ideal for high ambient environments with 5500 lumens. Its multiple inputs including HDBaseT™ allow it to broadcast HD images, sound and control via a single cable. Challenge: As part of a wider renovation and modernisation of its meeting and seminar rooms, the Hotel Pullman Bordeaux Lac wanted full integration of video projectors into a centralised AV system. Solution: VERGEZ AVD SOLUTIONS chose to install 11 Optoma ProScene EH515T projectors for their HDBaseT™ connectivity and high resolution. 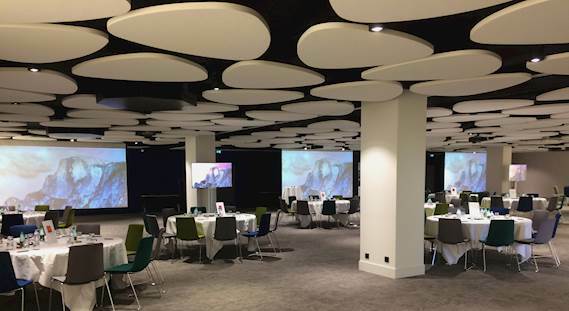 Results: The new seminar space at the Pullman Hotel is now completely flexible, offering a rich audio visual experience with the integration of Optoma video projectors into the VERGEZ AVD SOLUTIONS SAVME ™ centralised system. The Hotel Pullman Bordeaux Lac wanted to renovate 2000 square metres of meeting and seminars rooms that were previously equipped with only portable projectors. 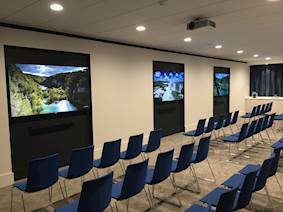 The brief was to pull together the latest high-tech audio visual equipment for maximum impact in their renovated meeting rooms that could be controlled and managed from a centralised hub. To create an ideal AV experience, it was essential the chosen projectors were high resolution, sufficiently bright, and simple to install with just one HDBaseT™ cable. The new layout concept for the seminar space was redesigned for modular meeting rooms with mobile partitions. It was important that the projectors could blend in with the new décor so as not to detract from the overall design or interfere with the viewing experience. VERGEZ AVD SOLUTIONS recommended and installed 11x ProScene EH515T projectors due to its Full HD resolution and high brightness of 5500 lumens. Designed for professional installations, the EH515T has multiple digital connections such as two HDMI inputs, DisplayPort and HDBaseT™. The HDBaseT™ connection makes it possible to transmit images in high definition with ease using a standard network cable up to 100 metres. This model is equipped with a 1.8x zoom and geometric correction. This function adjusts each corner of the image to create a square image, ideal for irregular walls or a projector installed at an angle. In addition, the EH515T can be repainted in any colour (which was beneficial as eight of the eleven projectors had to be repainted in black to blend with the ceiling with its black ovoid surface). VERGEZ AVD SOLUTIONS also deployed a bespoke architecture they developed called “SAVME ™ “ (Superior Audio Visual Meeting Experience) for meeting and seminar rooms which champions space-based audio calibration, excellent broadcast and image quality whilst managing a centralised network hub. By centralising management on the touch-sensitive tablets, SAVME ™ ensures the user-friendly interface experience. The new meeting and seminar rooms were opened on January 19th, 2017. The newly renovated 2000 square metre space forms several modular meeting pods with moveable partitions. In front of each projector are four metre wide motorised screens. The entire high-tech audio visual system provides a user-friendly experience and is controlled via tablets to avoid any connectivity and synching issues. 11x EH515T: Eight in black, three in white.